'Nava' means nine. 'Graha' means planets. As per Vedic Astrology, there are nine planets that influence our lives. The position of planet at the time of human birth will have influence on his actions and reaction to different situations in his life. Every Life as it is has its ups and downs. With there is improper planetary alignment for an individual it is called as a "dosha" or negative influence. Due to these "Navagraha doshas" people fall into depression and certain low moods. This low period may last for some period based on the power of the planet. However this can be averted with intelligence. Connecting to the cosmic intelligence to avert any hindrances in life and to bestow tremendous peace and success in life, Navagraga pooja is conducted. Navagraha Puja is a Vedic ritual which produces tremendous positive energy, and helps people to gain courage to face any situation in their lives. 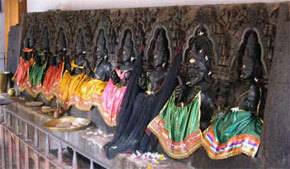 Navagraha Pooja is a collection of powerful rituals performed to the idols. Moon is the planet, which rules over mind and gives success. Chandra is a lovable God - Pleasing to the children as well as elders, universally appealing to everyone whatever may be the religion. Goddess Parvathi rules the planet. Jupiter known as Brihspati gives education and knowledge. He results in a cure from ailments and helps one cleanse his/her negative emotions and gives strength, valour, longevity, etc. He grants the boon of fatherhood to the childless, good education. He is ruled by Lord Dakshinamurthy. Saturn gives happiness.Saturn is generally known to affect one adversely on occasions when he occupies certain positions in one's horoscope. A prayer to him, especially on Saturdays, is said to mitigate the hardships one will have to face during these periods. He is ruled by Lord Yama. Kettu brings prosperity to the devotee's family removes the effect of bad, illness arising out of poisonous matter entering one's body. He grants good health, wealth and all round prosperity. prosperity.